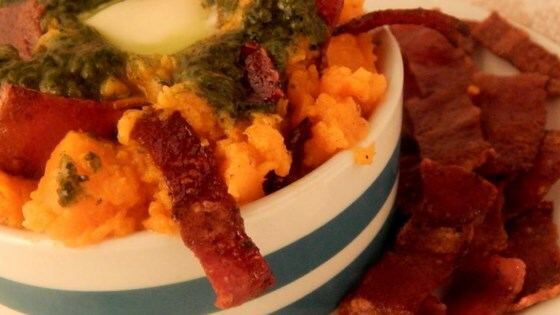 "Different take on a mashed sweet potato recipe. Kid- and husband-approved! You can use a prepared pesto spread instead of making one from scratch with the basil, almond, lemon juice, and olive oil." Place sweet potatoes into a saucepan, cover with chicken broth, and bring to a boil. Reduce heat to low, cover, and simmer until sweet potatoes are tender enough to pierce easily with a fork, about 10 minutes. Drain and return potatoes to pan; add butter and cover pan. Cook and stir bacon in a large skillet over medium heat until browned and crisp, about 10 minutes. Transfer bacon to paper towels to blot grease. Process basil and almonds in a food processor until pulverized, about 30 seconds, and slowly drizzle olive oil into the running food processor until thick, 1 to 2 minutes. Add lemon juice, salt, and black pepper to basil mixture and pulse several times to combine to make the pesto. Beat sweet potatoes in a bowl with an electric mixer on medium speed, slowly adding milk, until potatoes are fluffy and smooth. Alternatively, mash sweet potatoes with a fork if you prefer a more chunky texture. Season to taste with more salt; stir in pesto and bacon. Serve immediately. You can convert this to a "paleo" recipe by omitting the milk and butter. The idea of this recipe sounds like it would be tasty... But the flavor combo of adding the pesto is just too strange. I bet it would be great without the pesto.